Continuing our exploratioin of Bon Iver and the Little Things, here’s a very entertaining and well-written review by Kate Dries of WBEZ of Bon Iver’s recent show in Chicago. Standing after every song and cheering, while throwing up a “Rock On!” hand signal, this middle-aged man seemed utterly dismayed at the lack of visible excitement from audience members, who mostly stayed seated, getting up only to replenish their plastic cups. At one point, he even turned around to the audience and yelled “‘C’mon Chicago!” in a frustrated voice. Now we haven’t had the pleasure of seeing Bon Iver live since Pitchfork 2007, but we did enjoy seeing Bon Iver playing in the supergroup Gayngs during which they soulfully rocked the auto-tune for a packed Metro last fall. Maybe this fan would’ve liked that Metro show a bit more than this ultra-subdued gig at the Chicago Theater? 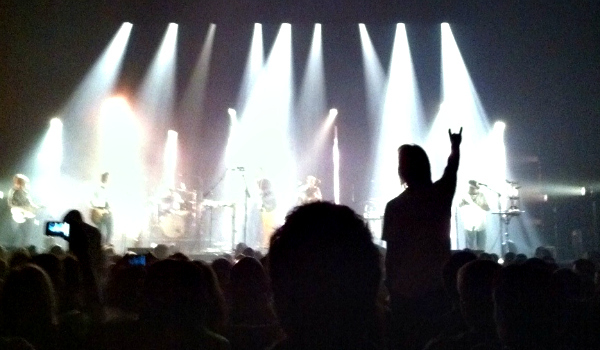 Were you at this Bon Iver show at the Chicago Theater? Have you ever witnessed a similar moment where a fellow fan annoyingly insisted that you share in his or her desire to rock, when you just wanted to chill? We invite you to share your concert experiences in the comments below, so they can be included in a future episode of Live Fix Radio.